Posted on May 6, 2013	by Picture This Great Teaching	in Middle School, New Technology Network	with Comments Off on Kate E.
When I picture great teaching I see a person who is sometimes willing to do something embarrassing, messy, or unexpected to reach students. In a recent unit discussing Newton’s Three Laws of Motion, eggs were used to show the effects of inertia. A raw egg will continue to spin on a flat surface, even when stopped because of the inertia of the liquid inside. A hard-boiled egg will stop easier because its inside is a solid. If students could correctly identify the eggs, they could pick which one was then cracked on the teacher’s head. 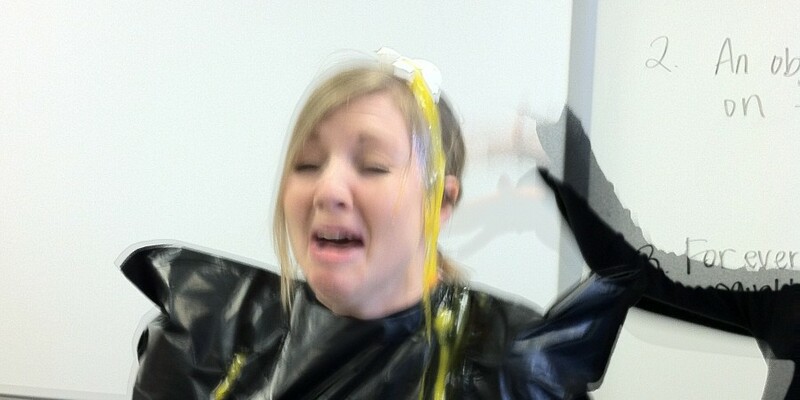 Despite pleadings to pick a hard boiled one, every student wanted to see a raw egg cracked on the teacher’s head. While messy and slightly unpleasant, this experience gave a lasting memory about inertia to those students.